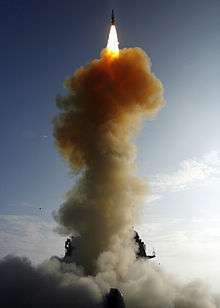 RIM-161 Standard Missile 3 launched from USS Lake Erie, a US Navy Ticonderoga class cruiser, 2005. Anti-satellite weapons (ASAT) are space weapons designed to incapacitate or destroy satellites for strategic military purposes. The development and design of anti-satellite weapons has followed a number of paths. The initial efforts by the USA and the USSR were using ground-launched missiles from the 1950s; many more exotic proposals came afterwards. U.S. Vought ASM-135 ASAT missile launch on Sep. 13, 1985, which destroyed P78-1. In the late 1950s the U.S. Air Force started a series of advanced strategic missile projects under the designation Weapon System WS-199A. One of the projects studied under the 199A umbrella was Martin's Bold Orion air-launched ballistic missile (ALBM) for the B-47 Stratojet, based on the rocket motor from the Sergeant missile. Twelve test launches were carried out between 26 May 1958 and 13 October 1959, but these were generally unsuccessful and further work as an ALBM ended. The system was then modified with the addition of an Altair upper stage to create an anti-satellite weapon with an 1100-mile (1700-km) range. Only one test flight of the anti-satellite mission was carried out, making a mock attack on the Explorer 6 at an altitude of 156 miles (251 km). To record its flight path, the Bold Orion transmitted telemetry to the ground, ejected flares to aid visual tracking, and was continuously tracked by radar. The missile successfully passed within 4 miles (6.4 km) of the satellite, which would be suitable for use with a nuclear weapon, but useless for conventional warheads. A similar project carried out under 199A, Lockheed's High Virgo, was initially another ALBM for the B-58 Hustler, likewise based on the Sergeant. It too was adapted for the anti-satellite role, and made an attempted intercept on Explorer 5 on 22 September 1959. However, shortly after launch communications with the missile were lost and the camera packs could not be recovered to see if the test was successful. In any event, work on the WS-199 projects ended with the start of the GAM-87 Skybolt project. Simultaneous U.S. Navy projects were also abandoned although smaller projects did continue until the early 1970s. The use of high altitude nuclear explosions to destroy satellites was considered after the tests of the first conventional missile systems in the 1960s. During the Hardtack Teak test in 1958 observers noted the damaging effects of the electromagnetic pulse (EMP) caused by the explosions on electronic equipment, and during the Starfish Prime test in 1962 the EMP from a 1.4 Mt warhead detonated over the Pacific damaged three satellites and also disrupted power transmission and communications across the Pacific. Further testing of weapons effects was carried out under the DOMINIC I series. An adapted version of the nuclear armed Nike Zeus was used for an ASAT from 1962. Codenamed Mudflap, the missile was designated DM-15S and a single missile was deployed at the Kwajalein atoll until 1966 when the project was ended in favour of the USAF Thor-based Program 437 ASAT which was operational until 6 March 1975. Another area of research was directed into energy weapons, including a nuclear-explosion powered X-ray laser proposal developed at Lawrence Livermore National Laboratory (LLNL) in 1968. Other research was based on more conventional lasers or masers and developed to include the idea of a satellite with a fixed laser and a deployable mirror for targeting. LLNL continued to consider more edgy technology but their X-ray laser system development was cancelled in 1977 (although research into X-ray lasers was resurrected during the 1980s as part of the SDI). ASATs were generally given low priority until 1982, when information about a successful USSR program became widely known in the west. A "crash program" followed, which developed into the Vought ASM-135 ASAT, based on the AGM-69 SRAM with an Altair upper stage. The system was carried on a modified F-15 Eagle that carried the missile directly under the central line of the plane. The F-15's guidance system was modified for the mission and provided new directional cueing through the pilot's head-up display, and allowed for mid-course updates via a data link. The first launch of the new anti-satellite missile took place in January 1984. The first, and only, successful interception was on September 13, 1985. 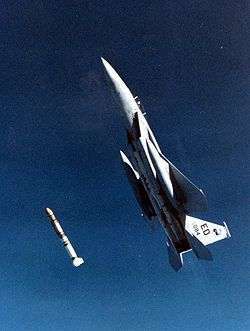 The F-15 took off from Edwards Air Force Base, climbed to 38,100 feet (11,613 m) and vertically launched the missile at the Solwind P78-1, a U.S. gamma ray spectroscopy satellite orbiting at 555 km (345 mi), which was launched in 1979. Although successful, the program was cancelled in 1988. On February 21, 2008, the U.S. Navy destroyed malfunctioning U.S. spy satellite USA-193 using a ship-fired RIM-161 Standard Missile 3. 1986 DIA illustration of the IS system attacking a target. The origins of the Soviet anti-satellite weapon program are unclear. According to some accounts, Sergei Korolev started some work on the concept in 1956 at his OKB-1, while others attribute the work to Vladimir Chelomei's OKB-52 around 1959. What is certain is that at the beginning of April 1960, Nikita Khrushchev held a meeting at his summer residence in Crimea, discussing an array of defense industry issues. Here, Chelomei outlined his rocket and spacecraft program, and received a go-ahead to start development of the UR-200 rocket, one of its many roles being the launcher for his anti-satellite project. The decision to start work on the weapon was made in March 1961 as the Istrebitel Sputnik (IS) (lit. "fighter satellite"). The IS system was "co-orbital", approaching its target over time and then exploding a shrapnel warhead close enough to kill it. The missile was launched when a target satellite's ground track rises above the launch site. Once the satellite is detected, the missile is launched into orbit close to the targeted satellite. It takes 90 to 200 minutes (or one to two orbits) for the missile interceptor to get close enough to its target. The missile is guided by an onboard radar. The interceptor, which weighs 1400 kg, may be effective up to one kilometer from a target. Delays in the UR-200 missile program prompted Chelomei to request R-7 rockets for prototype testing of the IS. Two such tests were carried out on November 1, 1963 and April 12, 1964. Later in the year Khrushchev cancelled the UR-200 in favor of the R-36, forcing the IS to switch to this launcher, whose space launcher version was developed as the Tsyklon-2. Delays in that program led to the introduction of a simpler version, the 2A, which launched its first IS test on October 27, 1967, and a second on April 28, 1968. Further tests carried out against a special target spacecraft, the DS-P1-M, which recorded hits by the IS warhead's shrapnel. A total of 23 launches have been identified as being part of the IS test series. The system was declared operational in February 1973. The world's first successful interception of satellite cosmic forces troops was completed in February 1970 For the first successful test (the second of all) has been achieved 32 hits (each could penetrate 100mm of armor). Testing resumed in 1976 as a result of the U.S. work on the Space Shuttle. Elements within the Soviet space industry convinced Leonid Brezhnev that the Shuttle was a single-orbit weapon that would be launched from Vandenberg Air Force Base, maneuver to avoid existing anti-ballistic missile sites, bomb Moscow in a first strike, and then land. Although the Soviet military was aware these claims were false, Brezhnev believed them and ordered a resumption of IS testing along with a Shuttle of their own. As part of this work the IS system was expanded to allow attacks at higher altitudes and was declared operational in this new arrangement on July 1, 1979. However, in 1983, Yuri Andropov ended all IS testing and all attempts to resume it failed. Ironically, it was at about this point that the U.S. started its own testing in response to the Soviet program. The Soviet Union also experimented with large, ground-based ASAT lasers from the 1970s onwards (see Terra-3), with a number of U.S. spysats reportedly being 'blinded' (temporarily) during the 1970s and 1980s. The USSR had also researched directed energy weapons, under the Fon project from 1976, but the technical requirements needed of the high-powered gas dynamic lasers and neutral or charged particle beam systems seemed to be beyond reach. In the early 1980s, the Soviet Union also started developing a counterpart to the U.S. air-launched ASAT system, using modified MiG-31 'Foxhounds' (at least six of which were completed) as the launch platform. The USSR also experimented with Almaz military space stations, arming them with fixed Rikhter R-23 autocannons. One last Soviet design worth mentioning is 11F19DM Skif-DM/Polyus, an orbital battlestation with a megawatt-range laser that failed on launch in 1987. The era of the Strategic Defense Initiative (proposed in 1983) focused primarily on the development of systems to defend against nuclear warheads, however, some of the technologies developed may be useful also for anti-satellite use. After the Soviet Union collapsed, there were proposals to use this aircraft as a launch platform for lofting commercial and science packages into orbit. Recent political developments (see below) may have seen the reactivation of the Russian Air-Launched ASAT program, although there is no confirmation of this as yet. The Strategic Defense Initiative gave the US and Soviet ASAT programs a major boost; ASAT projects were adapted for ABM use and the reverse was also true. The initial US plan was to use the already-developed MHV as the basis for a space based constellation of about 40 platforms deploying up to 1,500 kinetic interceptors. By 1988 the US project had evolved into an extended four stage development. The initial stage would consist of the Brilliant Pebbles. defense system, a satellite constellation of 4,600 kinetic interceptors (KE ASAT), of 100 lb (45 kg) each, in Low Earth orbit, and their associated tracking systems. The next stage would deploy the larger platforms and the following phases would include the laser and charged particle beam weapons that would be developed by that time from existing projects such as MIRACL. The first stage was intended to be completed by 2000 at a cost of around $125 billion. Research in the U.S. and the Soviet Union was proving that the requirements, at least for orbital based energy weapon systems, were, with available technology, close to impossible. Nonetheless, the strategic implications of a possible unforeseen breakthrough in technology forced the USSR to initiate massive spending on research in the 12th Five Year Plan, drawing all the various parts of the project together under the control of GUKOS and matching the U.S. proposed deployment date of 2000. Ultimately, the Soviet Union approached the point of experimental implementation of orbital laser platforms with the (failed) launch of Polyus. Both countries began to reduce expenditure from 1989 and the Russian Federation unilaterally discontinued all SDI research in 1992. Research and Development (both of ASAT systems and other space based/deployed weapons) has, however, reported to have been resumed under the government of Vladimir Putin as a counter to renewed U.S. Strategic Defense efforts post Anti-Ballistic Missile Treaty. However, the status of these efforts, or indeed how they are being funded through National Reconnaissance Office projects of record, remains unclear. The U.S. has begun working on a number of programs which could be foundational for a space-based ASAT. These programs include the Experimental Spacecraft System (USA-165), the Near Field Infrared Experiment (NFIRE), and the space-based interceptor (SBI). At 5:28 p.m. EST January 11, 2007, the People's Republic of China successfully destroyed a defunct Chinese weather satellite, FY-1C. The destruction was reportedly carried out by an SC-19 ASAT missile with a kinetic kill warhead similar in concept to the American Exoatmospheric Kill Vehicle. FY-1C was a weather satellite orbiting Earth in polar orbit at an altitude of about 865 km (537 mi), with a mass of about 750 kg (1,650 lb). Launched in 1999, it was the fourth satellite in the Feng Yun series. The missile was launched from a mobile Transporter-Erector-Launcher (TEL) vehicle at Xichang (28°14′49″N 102°01′30″E﻿ / ﻿28.247°N 102.025°E﻿ / 28.247; 102.025﻿ (Xichang Satellite Launch Center)) and the warhead destroyed the satellite in a head-on collision at an extremely high relative velocity. Evidence suggests that the same SC-19 system was also tested in 2005, 2006, 2010, and 2013, although none of those events created any long-lived orbital debris. In May 2013, the Chinese government announced the launch of a suborbital rocket carrying a scientific payload to study the upper ionosphere. However, U.S. government sources described it as the first test of a new ground-based ASAT system. An open source analysis, based in part on commercial satellite imagery, found that it may indeed have been a test of a new ASAT system that could potentially threaten U.S. satellites in geostationary Earth orbit. Launch of the SM-3 missile used to destroy USA-193. USA-193 was an American Reconnaissance satellite, which was launched on 14 December 2006 by a Delta II rocket, from Vandenberg Air Force Base. It was reported about a month after launch that the satellite had failed. In January 2008, it was noted that the satellite was decaying from orbit at a rate of 1,640 feet (500 m) per day. 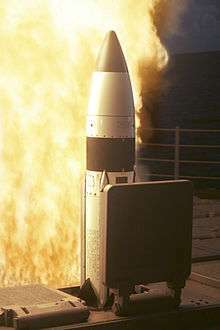 On 14 February 2008, it was reported that the United States Navy had been instructed to fire an RIM-161 Standard Missile 3 ABM weapon at it, to act as an anti-satellite weapon. According to the U.S. Government, the primary reason for destroying the satellite was the approximately 1,000 lb (450 kg) of toxic hydrazine fuel contained on board, which could pose health risks to persons in the immediate vicinity of the crash site should any significant amount survive the re-entry. On February 20, 2008, it was announced that the launch was carried out successfully and an explosion was observed consistent with the destruction of the hydrazine fuel tank. Experts debated whether the hydrazine tank would have survived an uncontrolled reentry. However, if it had, any human fatality would still have been very unlikely. Although hydrazine is toxic, a small dose would not have been immediately lethal. The chance of the (assumed intact) hydrazine tank landing close enough to at least one person for that person to be killed if he or she lingered in the vicinity of the crash site was about one percent, while the cost of the intercept was about $100 million. The successful flight test of Russia’s direct ascent anti-satellite missile, known as Nudol, took place Nov. 18, 2015, according to defense officials familiar with reports of the test. In May 2016, Russia tested the Nudol for the second time. It was launched from the Plesetsk cosmodrome test launch facility, located 500 miles north of Moscow. While it has been suggested that a country intercepting the satellites of another country in a conflict, namely between China and the United States, could seriously hinder the latter's military operations, the ease of shooting down orbiting satellites and their effects on operations has been questioned. Although satellites have been successfully intercepted at low orbiting altitudes, the tracking of military satellites for a length of time would be less accurate than previous commercial or defective intercepts that did not employ any defensive measure like simple inclination changes. Depending on the level of tracking capabilities, the interceptor would have to pre-determine the point of impact while compensating for the satellite's lateral movement and the time for the interceptor to climb and move; U.S. intelligence, surveillance and reconnaissance (ISR) satellites orbit at about 800 km (500 mi) high and move at 7.5 km/s (4.7 mi/s), so a Chinese Intermediate-range ballistic missile would need to compensate for 1,350 km (840 mi) of movement in the three minutes it takes to boost to that altitude. Even if an ISR satellite is knocked out, the U.S. possess an extensive array of manned and unmanned ISR aircraft that could perform missions at standoff ranges from Chinese land-based air defenses, making them somewhat higher priority targets that would consume fewer resources to better engage. Global Positioning System and communications satellites orbit at higher altitudes of 20,000 km (12,000 mi) and 36,000 km (22,000 mi) respectively, putting them out of range of solid-fueled Intercontinental ballistic missiles. Liquid-fueled space launch vehicles could reach those altitudes, but they are more time-consuming to launch and could be attacked on the ground before being able to launch in rapid succession. 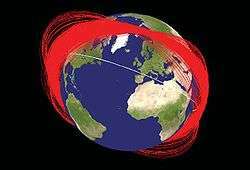 The constellation of 30 GPS satellites provides redundancy where at least four satellites can be received in six orbital planes at any one time, so an attacker would need to disable at least six satellites to disrupt the network. Even if this is achieved, signal degradation only lasts for 95 minutes, leaving little time to take much decisive action, and backup inertial navigation systems (INS) would still be available for relatively accurate movement as well as laser guidance for weapons targeting. For communications, the Naval Telecommunications System (NTS) used by the U.S. Navy uses three elements: tactical communications among a battle group; long-haul communications between shore-based forward Naval Communications Stations (NAVCOMSTAs) and deployed afloat units; and strategic communication connecting NAVCOMSTAs with National Command Authorities (NCA). The first two elements use line-of-sight (25–30 km (13–16 nmi; 16–19 mi)) and extended line-of-sight (300–500 km (160–270 nmi; 190–310 mi)) radios respectively, so only strategic communications are dependent on satellites. China would prefer to cut off deployed units from each other and then negotiate with the NCA to have the battle group withdraw or stand down, but ASATs could only achieve the opposite. Even if somehow a communications satellite were hit, a battle group could still perform its missions in the absence of direct guidance from the NCA. The Arrow 3 or Hetz 3 is an anti-ballistic missile, currently in development. It will provide exo-atmospheric interception of ballistic missiles. It is also believed (by experts such as Prof. Yitzhak Ben Yisrael, chairman of the Israel Space Agency), that it will operate as an ASAT. In a televised press briefing during the 97th Indian Science Congress in Thiruvananthapuram, the Defence Research and Development Organisation Director General Rupesh announced that India was developing the necessary technology that could be combined to produce a weapon to destroy enemy satellites in orbit. On February 10, 2010, Defence Research and Development Organisation Director-General and Scientific Advisor to the Defence Minister, Dr VK Saraswat stated that India had "all the building blocks necessary" to integrate an anti-satellite weapon to neutralize hostile satellites in low earth and polar orbits.India is known to have been developing an exo-atmospheric kill vehicle that can be integrated with the missile to engage satellites. In the early 1980s, the Soviet Union had developed two MiG-31D 'Foxhounds' as a launch platform for a potential Vympel Anti-Satellite weapon system. After the collapse of the Soviet Union, this project was put on hold due to reduced defense expenditures. However, in August 2009, the Russian Air Force had announced the resumption of this program. Further reports in May 2010 based on statements from Col. Eduard Sigalov in Russia's air and space defense forces, indicated that Russia was "developing a fundamentally new weapon that can destroy potential targets in space." The Sokol Eshelon is a prototype laser system based on an A-60 airplane which is reported to be restarting development in 2012. ↑ Grier, Peter. "The Flying Tomato Can." Air Force magazine, February 2009. Retrieved: 9 February 2013. ↑ Kestenbaum, David (January 19, 2007). 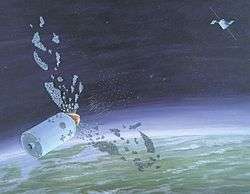 "Chinese missile destroys satellite in 500 mile orbit". NPR. ↑ IS anti-satellite system Archived January 2, 2008, at the Wayback Machine. ↑ The Heritage Foundation. . Accessed January 21, 2012. ↑ "China silent on satellite killer". Beijing. AFP. January 18, 2007. Archived from the original on 2007-02-10. ↑ "Anti-satellite Tests in Space - The Case of China" (PDF). Secure World Foundation. 16 August 2013. ↑ "China once again high-altitude scientific exploration test: height higher data more". China News Network. 14 May 2013. ↑ Shalal-Esa, Andrea (15 May 2013). "U.S. sees China launch as test of anti-satellite muscle: source". Reuters. ↑ Weeden, Brian (17 March 2014). "Through a Glass, Darkly: Chinese, American, and Russian Anti-satellite Testing in Space" (PDF). Secure World Foundation. ↑ "U.S. plans for falling satellite". CNN. January 30, 2008. Archived from the original on 2008-01-31. ↑ Associated Press – Broken Satellite Will Be Shot Down Archived February 19, 2008, at the Wayback Machine. ↑ "Navy missile hits dying spy satellite, says Pentagon". CNN. February 21, 2008. ↑ "US shoots down toxic satellite". Daily Telegraph. 2008-02-20. Archived from the original on 2008-12-22. Retrieved 2008-02-20. ↑ Opall-Rome, Barbara (2009-11-09). 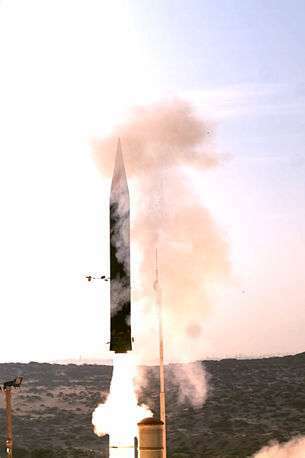 "Israeli experts: Arrow-3 could be adapted for anti-satellite role" (PDF). Imaginova SpaceNews.com: 16. Retrieved 2011-11-09. See also full article: #1 (2010-03-04). ↑ Jackson, Paul, ed. (1998). Jane's: All the World's Aircraft: 1998-99. Surrey: Jane's. p. 386. ISBN 0710617887. ↑ "USSR/CIS Miniature ASAT". Globalsecurity.org. ↑ "Is Russia ready for Star Wars? | Features & Opinion | RIA Novosti". En.rian.ru. Retrieved 2012-11-17. ↑ "Russian officer says developing new weapon for space defense". RIA Novosti. ↑ Podvig, Pavel (13 November 2012). "Russia to resume work on airborne laser ASAT". Russian Strategic Nuclear Forces. Retrieved 17 November 2012.